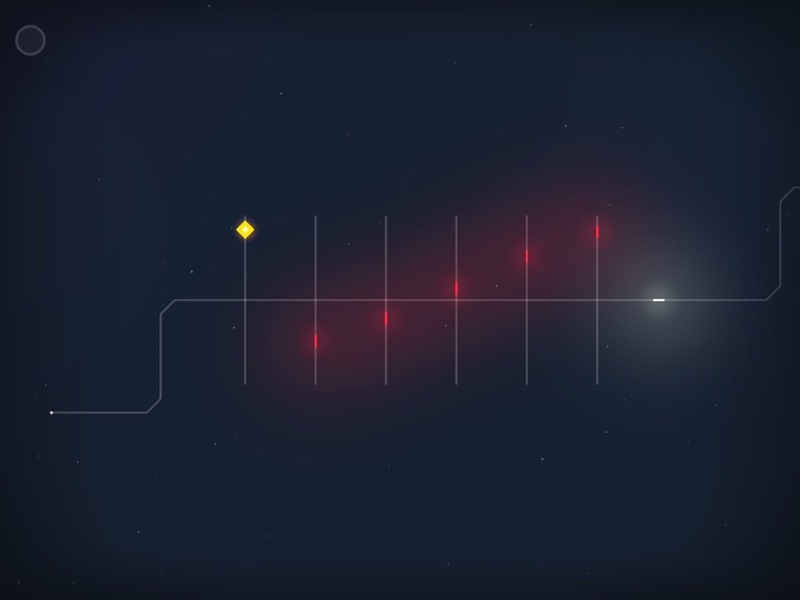 I heard about Brett Taylor’s (aka My Dog Zorro) minimalistic puzzler, Linelight, briefly when it arrived on PC earlier this year. It looked interesting, but since I don’t have much patience for playing on my PC, I forgot all about it. I didn’t even know that the developer was porting it over to mobile until I saw it available in the App Store this week. I still didn’t know that much about it, but it got a lot of praise on other platforms and $1.99 is an easy impulse buy for me if a game looks like my kind of thing. What I didn’t expect is how perfect the game would feel on mobile, like it was designed specifically for phones. I don’t know how many hours it took me to complete the game, but I spent three days playing almost nothing else. 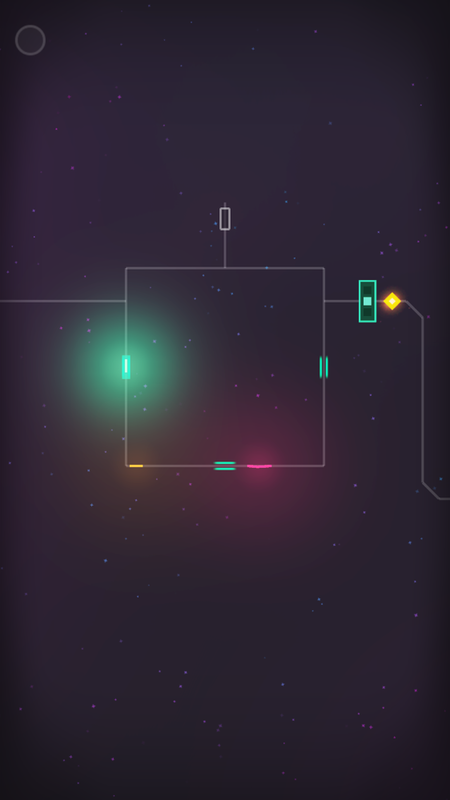 Every time I tried to take a break from Linelight because of a seemingly impossible puzzle, it kept calling me back. I just couldn’t put it down. And one of those things that made it so easy to keep picking it up again is that, despite being designed originally in landscape mode, the mobile version can be played in portrait with one hand. I’ve lamented other games being stuck in landscape, despite appearing to be perfect one-handed games. I spend a lot of time holding my phone and if a game can fit seamlessly between things like texting, Twitter and Facebook, I’ll spend far more time with it than if it’s stuck in landscape. In fact, if a game can be played with one hand, it’s about a thousand times more likely that I’ll play it through to the end. To make the game one-handed, Brett didn’t just simply rotate the puzzles. He made lots of little changes to help it fit the platform, spending the most time designing a smart virtual joystick that felt right. And I must say, he really nailed the controls. 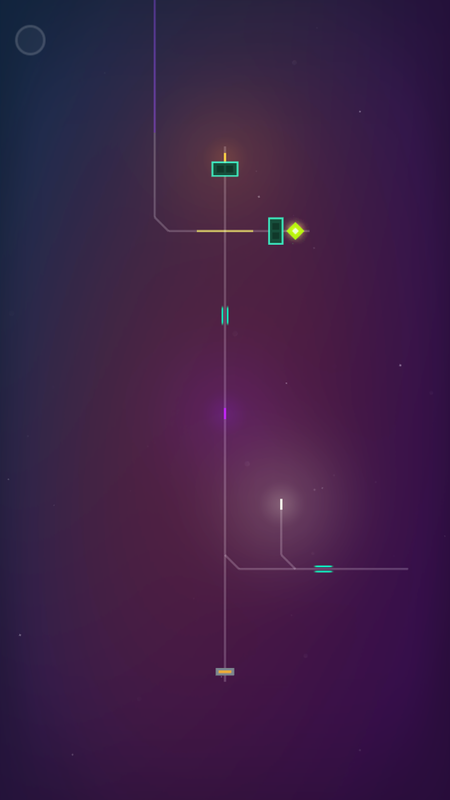 The game features minimalistic but elegant, stylish graphics and a chill soundtrack, as you control a small line of light zipping across tracks between bite-sized puzzles on a larger map, collecting stars. There are switches that move small sections of a path, keys that unlock doors, and all sorts of obstacles to overcome. You’ll also come across enemies with different movement patterns, who will kill you if you touch them, but you also need their help with puzzles. Sometimes, you might even consider them your friends. But you’ll spend a lot of time avoiding their death touch, so it’s imperative that you feel in control. And the game manages that by making the entire screen a joystick. You can place your finger anywhere, enabling you to find the spot that’s comfortable for you. It’s also not a big deal if you keep moving your finger to different spots, as it always works. And that way your fingers never get in the way of the action, either. But the thing that stood out to me the most is how smart the joystick is. It doesn’t require surgical precision — even when some puzzles might! I’m so used to bumping into walls with virtual joysticks that it took me a little while to even realize that I didn’t have to be so exact here. For instance, let’s say you overshoot a branching line that you wanted to go up. 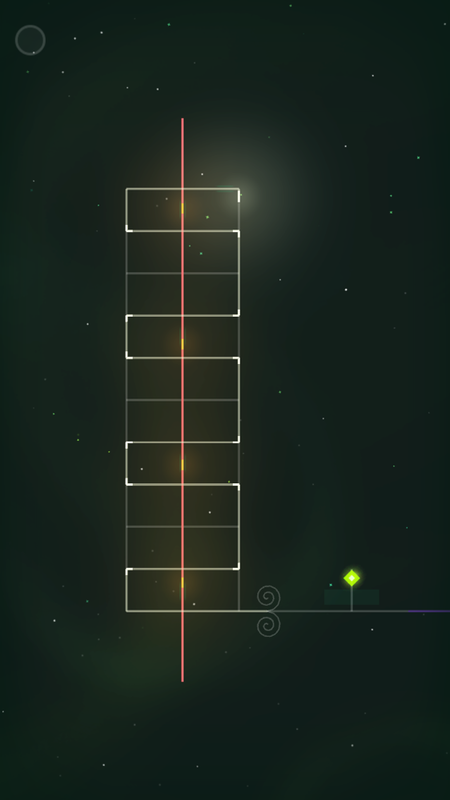 In many games, you would have to inch back and line up perfectly with the path before you can head through it. But here, as long as you’re close to the path and drag your finger in that direction, your light will go up instead of getting stuck. It gives the game a fluidity that keeps you progressing at a steady speed (of light?). 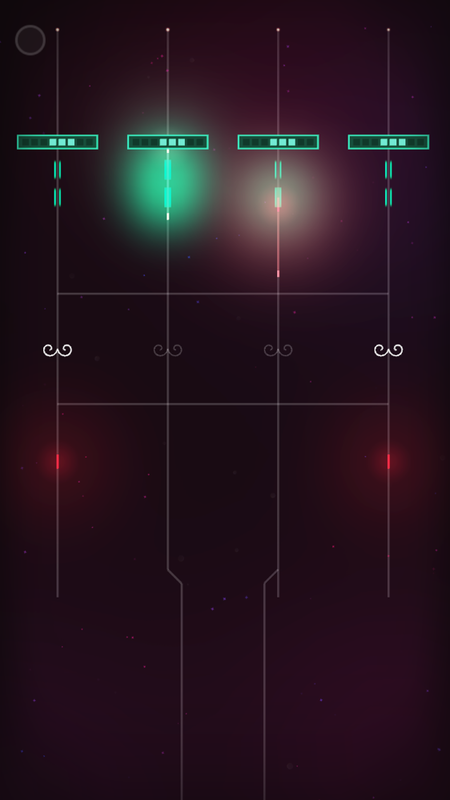 If I had to perfectly line up my light with each path, I likely would have gotten annoyed with the game fairly early on, especially as things get more hectic. But the controls have been designed so well for the platform that I don’t think I can blame any of my failures on the controls, only my own error. There are a couple of other controls you’ll have to learn and get used to using. I mentioned the enemies with different movement patterns. What’s interesting here, though, is that you can control some of them yourself. While red lights move on their own in real time, independent of your own movements, orange ones only move when you do. But to keep you from having to move back and forth in one spot to get them to go where you want, the game allows you to double tap and hold your finger on the screen to keep them moving while you stay still. It takes a little more getting used to than the joystick, but after some time it becomes second nature. Much later in the game, you’ll be able to pull a certain enemy towards you by tapping and holding your finger on your own light. It’s not my favorite mechanic in the game, and it does mean sometimes having your finger covering the action. But it’s late-game and less prominent than the other lights you encounter. Overall, I think he did a superb job making the controls work for touchscreens, something that’s not an easy feat. There are also hidden puzzles that you can easily miss your first time around, but their general area is marked on the world map so you can go back later and look for them. I liked searching for them, but appreciated that I didn’t have to spend hours pixel hunting the entire game to find them. They were fun to find and I appreciated the extra challenge without the rest of the game being locked behind deviously hard puzzles. The game also teaches you everything through very little instruction. You’re meant to discover most things through trial and error. And when you do solve a puzzle in a way you didn’t realize was possible, it’s a real eureka moment. My favorite puzzles are the ones that require out-of-the-box thinking, but are less reliant on speed and reflex. Most of the game is relaxing, especially since there’s no real penalty for death. But there are some puzzles that stressed me out because I didn’t feel like I was fast enough to pull off the solutions. Sometimes it turned out I was over-complicating things and there was a much simpler solution I was overlooking. Those moments usually bred sighs of relief. But there are still some tough ones to pull off. Most are bonus levels, though, and can be skipped until you feel like coming back and working on them. Usually puzzles on the linear path seemed daunting at first glance but were really not as bad as I expected. I don’t want to spoil all the surprises, but some examples of puzzles could involve positioning yourself and an enemy in specific spots at the same time to open a gate. Others might require you to traverse a deadly maze to retrieve a key, then bring it back to the other side to use it. My favorite worlds were the third and fourth ones, where you can grow a tail and become a snakelight, which reminded me a lot of Snakebird. Some puzzles have checkpoints midway while others force you to restart the whole puzzle if you die. But for the most part, the game is of the forgiving sort, and not trying to punish you. 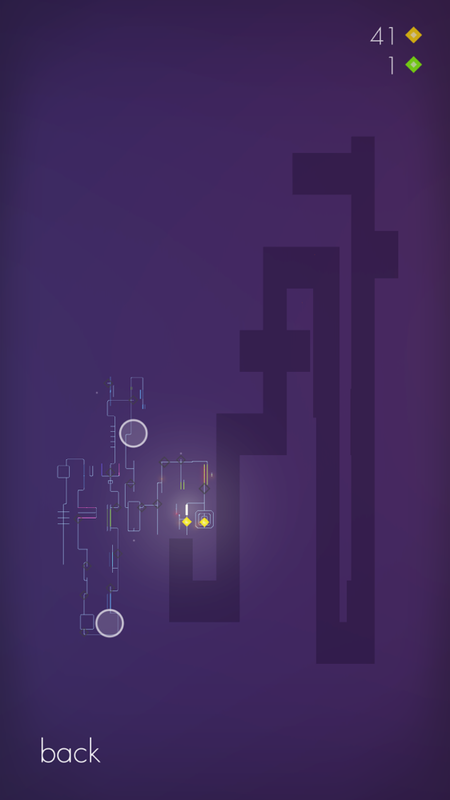 While most puzzles are self-contained, sometimes you have to use elements from previous levels to solve a new one. I really liked that aspect, as it brings the whole map together instead of being a series of connected but disconnected puzzles. As I mentioned above, I thought the enemies that you can attract to yourself were among the weaker puzzles of the game. They come in the fifth world and took a lot of getting used to, unlike the other enemies. They’re more physics-based than the rest, and I found their movements a bit hard to predict. There were times I got stressed out over them and was worried I’d end up quitting. Still, I persisted and was able to complete everything in the game. In many ways, the experience reminded me of Mushroom 11, one of my favorite games of this year. Both games started on PC but are natural fits for iOS. And they’re both relaxing experiences for the most part. But at times they get very skill-based and more stressful. I also worried I’d give up on Mushroom 11 before finishing it, but I persisted in both games. I loved them both enough to push through the frustrations so I could enjoy the full experience. They both do such clever things and I didn’t want to miss out on any of it. 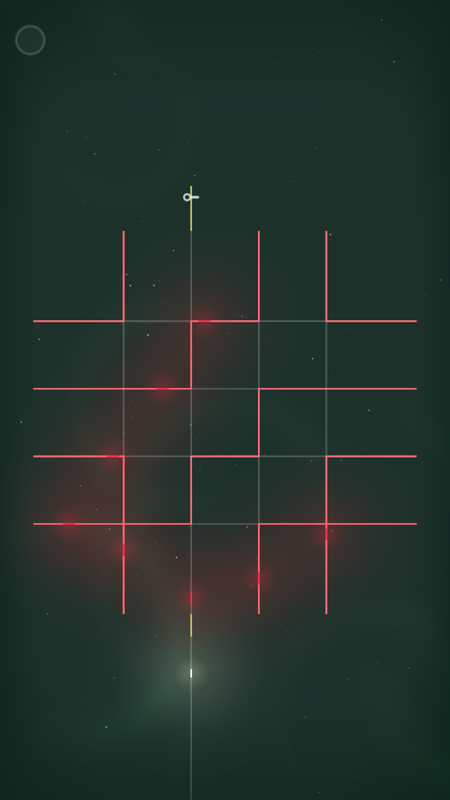 One thing that Mushroom 11 has over Linelight is more persistent checkpoints. With Linelight, there are plentiful checkpoints, but they’re not always persistent. Meaning, you may stop at a tricky part and close the game, not realizing that the last real save point was a good ways back. This happened to me and I had to catch up to where I had left off and then make sure I completed the world before taking another break. It’s not ideal for mobile, but as long as you know going in, it’s not too big of a problem. And the developer explained that a big part of the reason is to avoid having the game get stuck in an un-winnable save state. Still, I would have appreciated some sort of indication of where the save points are. As is, you wouldn’t really know that the last long stretch of each world has no persistent checkpoints without someone telling you or finding out by losing some progress. The level select screen leaves some things to be desired, too. You can go back to earlier parts of the map, but it will still involve some backtracking, unfortunately. None of the worlds are so huge that this will cause a big time sink, though. I also encountered some bugs that hampered the late-game experience a bit. Most of them have existed in all versions of the game because the developer has not been able to squash them yet. None of them are truly game-breaking, but they can be a bit of a nuisance. Still, it’s worth putting up with them to experience this magnificent game. And the developer does seem to be on top of things, dealing with new bugs that appear. And finally, the ending of the last world was just beautiful. I don’t want to spoil it, so I won’t say more. But it made all the effort worthwhile. Any frustrations I had with the game melted away and I was just sad it was over. Coming off from such a well-designed game, I didn’t know what to do with myself. So I started a new save file. I don’t think I’ll play through the whole game again, but there’s something just so satisfying about it that I miss playing around with my little light friends (and enemies). There is some good and bad news, though, for those who can’t get enough of it. The bad news is that some content is missing in this version that’s in the PC and console versions. The good news is that the developer said it’s coming in an update in a few weeks. So you’ll have something to look forward to even after you finish the current content. I don’t know yet whether it will cost extra or be included in the original price, but I’ll gladly pay more if necessary. I already got a lot more than my $1.99 worth of entertainment from this gem of a game and it’s almost criminal how cheap it is. Even if you get too frustrated in the later worlds to complete it, the first four worlds are a must-have experience. If the game looks at all like something you’d enjoy and you don’t mind some reflex- and skill-based challenges, you can’t go wrong with Linelight. So what are you waiting for? Grab the game here and get immersed in its simple beauty. And if you’re having some trouble with the puzzles, try my guide with helpful tips here. I had seen this but wasn’t really interested until your email review arrived today.